It’s been downright balmy in San Francisco this week, sunny and in the seventies. It got me thinking about beaches, coconuts, papayas, and other things tropical. I had been planning on making Vietnamese coffee cupcakes and stumbled upon a recipe for baked coconut rice pudding. I settled quickly on using the rice pudding as a stuffing for a cupcake and went from there. The end result was quite delicious. I found though that the cupcakes tasty significantly better the second day after all the flavors had time to meld together. The rice pudding is fantastic on its own and the recipe provides for plenty of left overs. 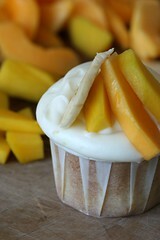 In fact each individual component – the pudding, the simple cake, the frosting, the fruit – is great. And even if one thing didn’t quite come out, you’d still have a tasty treat on your hands. 7. Add about one third the milk/lime juice mixture and beat until combined. 1. Toast coconut if you haven’t already. Spread on a cookie sheet and place in 350 degree oven for a five or so minutes shaking occasionally until golden brown. 2. Mix the rice with the coconut milk, the milk and the sugar. 3. Grease an oven proof dish. Transfer mixture into the dish, top with chunks of butter, and place in the oven. Be careful, as this is a liquidy mixture and tends to spill. 4. 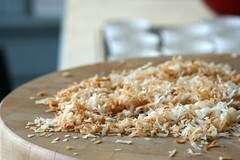 After 30 minutes stir in the coconut and return to the oven. 5. Cook for another 1-1/2 hours, or until almost all the milk is absorbed and a golden skin has formed on top of the pudding. 4. Add half of the sugar and the ginger. Beat until combined. Tip: For this recipe, where fresh fruit is set on top of the cupcake, it is best to use a cup or so more sugar to get a stiffer consistency. I didn’t do that and the fruit slid off somewhat in transit. 1. 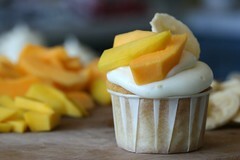 Using a small pairing knife, cut off the top of the cupcake in the shape of a cone. Flip the top over and cut off the base of the cone. 2. Fill the cavity with a teaspoon or so of rice pudding. 4. Frost with the frosting. 5. 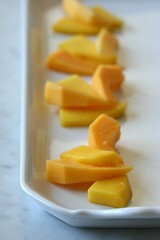 Arrange slices of thinly sliced tropical fruit, like papaya, mango, and banana. Ok, I’m definatley speechless at how delicious these look. Fantastic combination! these look fritzylicious. btw, when are you making the boston terrier cupcakes with 5% real terrier? i hear you can make a meal of those. For two seconds there I actually thought you were putting cantaloup on these babies and thinking why? WHY? but then it all became clear. First, you have a wonderful blog, beautiful pictures, well written with great information! Second, I had to try the ‘Nut & Party’ cups and purchased them at Michael’s. What a great idea! Though I didn’t fill them enough, you can check out my attempt at http://www.websorceress.com/2006/02/beautiful-in-red.html. Thanks for the inspiration your blog provides. I made the coconut rice pudding by itself. It wasn’t sweet enough for my taste and I probably overcooked the pudding. The next day it was just rice, no liquid. Is this the correct result? You should write a cookbook! In step 2 of the rice pudding recipe it says to add two-thirds of the sugar. What do you do with the last third? You win the “Find my flub” contest. The original recipe had two steps involving sugar, one to make a sauce. But when I changed up the recipe to make it a cupcake filling and I skipped the sauce. I decreased the amount of sugar, but didn’t fix the step. Yikes, thanks for finding it. kookoo kake, the pudding will get pretty solid overnight, that’s expected. I cooked mine until there was no liquid left (per the recipe I used as a basis). If you didn’t find it to me sweet enough, I suggest drizzling sweetened condensed milk over it. Though my diet doesn’t allow me to actually eat any of these things, I feel like I’m indulging when I visit your site. You really are full of talent. oh my goodness! i think u’re wonderful with cupcakes. how do you do it! u’re inspiring me a lot. :) thanks. and oh yes, if u know of any great carrot cake recipes, pls let me know. i’m wanting to do one for a friend’s bday the coming sat. For the pudding, what does 1-1/3 fluid ounces whole milk translate to in cups? Argh. Forgive me. Revisit the recipe, its been fixed. I converted everything from liquid ounces to cups. But wasn’t perfect about it. The rice pudding recipe was heavily adjusted and I have reviewed it again for accuracy. Blah. Been a fan of yours for ages. Always rush to ur blog to see of u hv created any new magical creations. Why don’t you do a cookbook? Frankly any one of ur recipes here are heads up over the cupcakes recipes i find in cookbooks. Especially here in Singapore. Anyway, keep up the good work. OMG, I will be sure to try this soon! What a beautiful cupcake! Ah! Made these for my friend’s 40th this weekend. 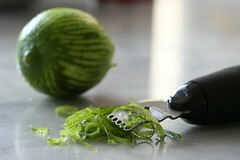 I decorated them with chopped candied ginger and lime rind curls (what do you call that?) since the trop. fruit wasn’t looking lovely this week. Still very pretty. Thought they’d go nicely after dinner of Vietnamese at Bodega Bistro here in SF and they were a huge hit. Thank you for the inspiration and generous recipe sharing! I got your link from 101 cookbooks and from there to your blog, I did not find this blog all this time. It is a wonderful one. These are so beautiful and with all of the ingredients–a real labor of love! Your site is amazing, You really should publish a book so your hard work/hobby pays off – you have the process, your photos are amazing. Very impressed. these sound wonderful! i was telling my boyfriend about your site, particularly about this cupcake and all the unusual flavors and he had the balls to say, “why don’t you make me some?” he’s actually very sweet. anywho, i want to try these out this weekend and was wondering if unsweetened coconut would work well for the rice pudding, i have a couple bags at home that i’d like to use. Thanks! Powdered ginger is fine as a substitute. Just use what you have, add slowly, and keep tasting until you get to something you like. these look absolutely glorious…should the rice be cooked or uncooked before using it in the pudding? i’m assuming uncooked, but i have no idea.